President Obama granted a commutation today to Chelsea Manning, a transgender soldier who was convicted of Espionage Act violations and other charges for leaking hundreds of thousands of classified documents to WikiLeaks. Manning was sentenced to 35 years in prison in 2013, and she will now be released on May 17, according to her lawyer. The documents that were leaked, about the U.S. military efforts in Iraq and Afghanistan, sparked a firestorm. She was one of 209 individuals granted commutations and 64 individuals who were given pardons by Obama today. Chase Strangio, Manning's attorney with the American Civil Liberties Union, confirmed the commutation to ABC News. "I'm relieved and thankful that the president is doing the right thing and commuting Chelsea Manning's sentence," Strangio said in a statement released by the ACLU. "Since she was first taken into custody, Chelsea has been subjected to long stretches of solitary confinement -- including for attempting suicide -- and has been denied access to medically necessary health care," Strangio added. "This move could quite literally save Chelsea's life, and we are all better off knowing that Chelsea Manning will walk out of prison a free woman, dedicated to making the world a better place and fighting for justice for so many." "I welcome President Obama's decision to commute the sentence of my alleged source Ms. Chelsea Manning from 35 years to time served," WikiLeaks founder Julian Assange said in a statement. "Ms. Manning should never have been convicted in the first place," he continued. "Ms. Manning is a hero, whose bravery should be applauded. Journalists, publishers, and their sources serve the public interest and promote democracy by distributing authentic information on key matters such as human rights abuses and illegal acts by government officials. They should not be prosecuted." Manning's commutation comes on one of Obama's final days in office. He has so far issued 1,385 commutations and 212 pardons. Senior administration officials said Obama's decision to commute most of Manning's remaining sentence was due to several factors. In addition to Manning having spent almost seven years in prison, one official said, she had accepted responsibility and remorse for the crimes she committed. The official also pointed to her sentence being longer than other individuals who had committed comparable crimes and commuting the sentence to time served brought in line with prior cases. However, the internal administration deliberations to commute the bulk of Manning's sentence did not receive universal support for the move. A U.S. official says that Defense Secretary Ash Carter was opposed to the idea of commuting Manning's sentence. Republican members of Congress blasted the decision. "This is just outrageous. Chelsea Manning's treachery put American lives at risk and exposed some of our nation's most sensitive secrets," House Speaker Paul Ryan said. "President Obama now leaves in place a dangerous precedent that those who compromise our national security won't be held accountable for their crimes." Senator John McCain called the decision "a grave mistake that I fear will encourage further acts of espionage and undermine military discipline." He added: "It is a sad, yet perhaps fitting commentary on President Obama's failed national security policies that he would commute the sentence of an individual that endangered the lives of American troops, diplomats, and intelligence sources by leaking hundreds of thousands of sensitive government documents to Wikileaks, a virulently anti-American organization that was a tool of Russia's recent interference in our elections." Manning is being held at the U.S. Disciplinary Barracks at Fort Leavenworth, Kansas, and reportedly tried to commit suicide twice in the last year. In 2010, then Private Bradley Manning was arrested in Baghdad for leaking hundreds of thousands of classified documents that he had access to as an Army intelligence analyst. The documents included military combat reports from Iraq and Afghanistan, as well as classified State Department cables. Manning provided the documents to the anti-secrecy website WikiLeaks, which then posted them online, creating an international sensation. In 2013, Manning was convicted on 22 charges including espionage, theft of military records or property, but was acquitted on the charge of aiding the enemy. Manning was sentenced to 35 years in a military prison. The day after her sentencing Manning disclosed that she was changing her gender identity and asked to be referred to as Chelsea. Manning's statement led to a new legal effort to have the Defense Department give her access to hormone treatments to help her transition to a female. 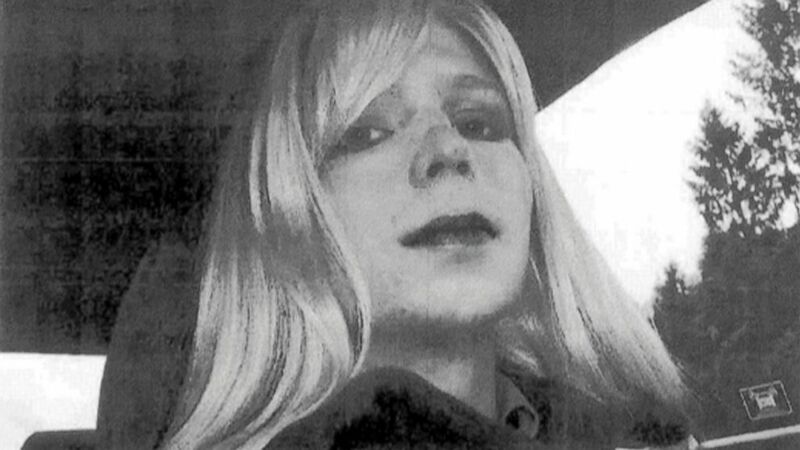 In early 2015, the Army allowed Manning to receive those treatments and to wear female clothing. However, she was not allowed to grow her hair because that would be in violation of military grooming standards. Manning's attorneys have disclosed that she attempted suicide twice this year to protest the access to the hormone therapy. Manning ended a five-day hunger strike in September after receiving assurances from the Army that she would be allowed to undergo gender reassignment surgery. In November, Manning's attorneys filed a request for the White House to commute the remainder of her 35 year sentence out of concerns for her mental state. "I encourage the President to act on Chelsea's request for a commutation of her sentence," Strangio said in a statement to ABC News earlier this month. "Her life depends on it and she has already served almost 7 years of her sentence -- longer than any whistleblower in United States history." ABC News' Serena Marshall contributed to this report.